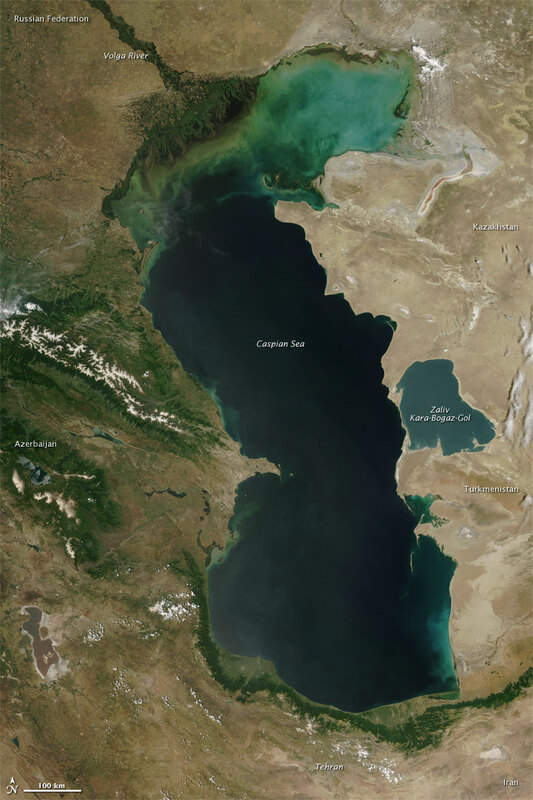 Measured by surface area, the Caspian Sea is the world’s largest inland water body. It covers roughly 371,000 square kilometers (143,200 square miles) and borders five countries. To the ancient Greeks and Persians, the lake’s immense size suggested it was an ocean, hence its name. 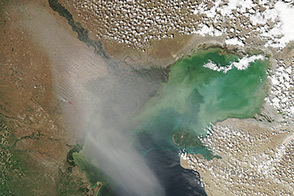 A large expanse of clear sky permitted an unobstructed view of the Caspian Sea in early June 2010. The Moderate Resolution Imaging Spectroradiometer (MODIS) on NASA’s Terra satellite captured this natural-color image on June 4, 2010. 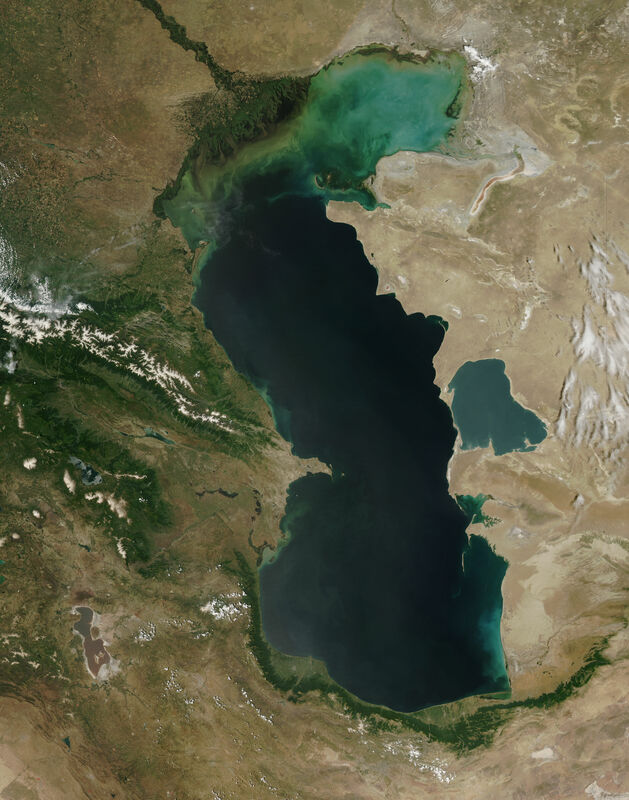 The color of the Caspian Sea darkens from north to south, thanks to changes lake in depth and perhaps sediment and other runoff. The northern part of the lake is just 5 to 6 meters (16 to 20 feet) deep. The southern end, however, plunges more than 1,000 meters (3,300 feet). Just as the lake reaches a greater depth in the south, the nearby land reaches a greater height. The mountains of northern Iran line the southern end of the giant lake, and emerald green vegetation clings to those mountain slopes. In marked contrast to the mountains, sand seas line the southeastern and northern perimeters of the lake, and marshes occur along the lake shores in Azerbaijan to the west. Multiple rivers empty into the Caspian Sea, the Volga being the largest. Lacking an outlet, the Caspian Sea loses water only by evaporation, leading to the accumulation of salt. 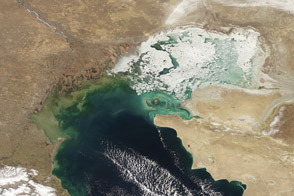 Although a lake, the Caspian is not a freshwater lake; the water delivered by the Volga River minimizes the lake’s salt content at the northern end, but the Caspian grows more saline to the south. Kara-Bogaz-Gol is a saline inlet along the lake’s eastern perimeter. Geological research indicates that the Caspian Sea was once part of a prehistoric sea known as the Paratethys. Tectonic forces uplifting the land and a drop in sea level left the Caspian landlocked more than 5 million years ago. Climate shifts have alternately raised and lowered the lake’s water levels, sometimes nearly drying it out completely. NASA image by Jeff Schmaltz, MODIS Rapid Response Team. Caption by Michon Scott. 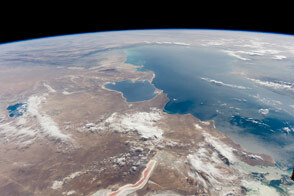 Acquired June 4, 2010, this natural-color image shows the Caspian Sea and the varied land surfaces surrounding it. LakeNet. (2004). Lake Profile: Caspian Sea. Accessed June 4, 2010. Popov, Sergej V., Shcherba, Irina G., Ilyina, Lubov B., Nevesskaya, Lidija A., Paramonova, Nina P., Khondkarian, Sergej O., Magyar, Imre. (2006). Late Miocene to Pliocene palaeogeography of the Paratethys and its relation to the Mediterranean. Palaeogeography, Palaeoclimatology, Palaeoecology, 238(1–4), 91-106. Wikipedia. (2010,May 27). Caspian Sea. Accessed June 4, 2010.